In traditional materials, insulators and metals are two entirely different material phases, but the bulk insulating and surface metallic properties are coexistence in topological material (Figure 1). This exotic electronic structure not only display rich fundamental physics but also provide possible applications in next generation electric devices, such as dissipationless spin current and quantum computations. 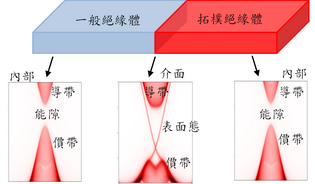 Recently, our research group successfully predicted the novel topological phases in much different kind of materials of various dimension, relying on the combined methods of first-principles calculations and theoretical modeling. In the next step, we are going to simulate spectroscopy experiment, directly to provide the required experimental parameters and the results of the signal. This research is expected to greatly reduce the experimental cost of synchrotron radiation source and related experimental equipment. Besides, we will construct material database and develop machine learning to search entirely new materials that never been synthetized previously. The success of this proposal will lead to the historic breakthrough not only on the understanding of fundamental physics but also on developing and designing future device applications. Figure1: The schematic band structure of topological material.